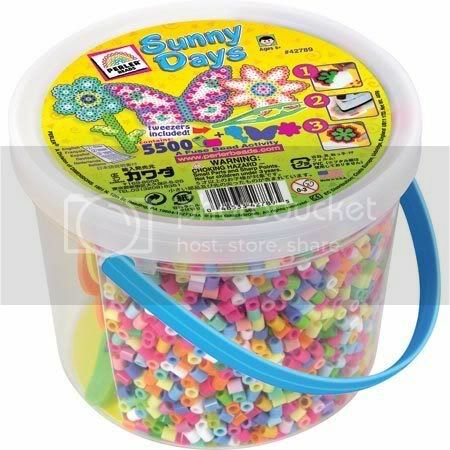 ~~This afternoon both girls were happily beading away at the dining room table when I heard the horrifying noise of a bucket of 8,500 beads hitting the floor and rolling everywhere. Heaven help me! I walked into the dining room and stood there, frozen, surveying the damage. Both girls looked up at me with giant eyes but neither one said a word. I think they were waiting for some sort of reaction. ~~Then it hit me like a stroke of lighting. My Dyson. Mother's sanity saver is what I call it. I got out the vacuum and made sure that the container was empty and wiped out. Then I vacuumed up all the beads and dumped them back into the bucket. Problem solved. I was also quite thankful that I had vacuumed the dining room the night before! ~~Within minutes the girls were back to their beading. Sierra was making a flowered light switch cover and Savannah was attempting a rainbow heart. ~~Have I mentioned how much I love my Dyson!? 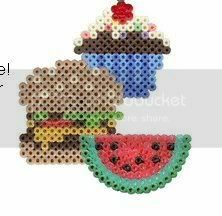 and I think I'll give Perler beads a second chance too. Ha! That is some quick thinking. I've heard they are good vacuums. I've always known Dysons are the best thing ever. I haven't gone a day without using mine at least twice ever since I got my new one for Christmas. Lol. We've been quilting here for the past two months, so we have snippets of yard all over our dining room floor by the end of the night and it's amazing not to have to haul out the huge vacuum and use that. good thinking! I will have to remember that as mine love Perler beads too. I tested my Dyson out when I knocked my electric pencil sharpener off my desk and those teeny tiny shavings went everywhere. But it worked!! It's especially have-a-german-shepherd-and-still-have-a-clean-house friendly too!. Now that is smart thinking lady!!! Not sure I could have seen such a simple solution whilst hyperventilating. Lol. Great going! I had to go look up Dyson, do you have the hand held one? They look super. I found your blog through Aunt Morgan's blog. I remember my daughter and a little girl I babysat dumping at least 25 tray puzzles out one time . I heard them saying it's snowing it's snowing. I came into the room to find puzzle pieces flying in the air. :-) No vacuum to get those up and sort them back to the right puzzle tray. I use a Dyson at a house I clean. Nice vacuum. I have a 6 year old who has been passionate about beads since she first laid eyes on one. Rogue beads can constantly be found in any corner or crevice of our home! Even if we haven't had any beading activities in months, they still seem to just...show up. My sympathies!